The Pew Charitable Trusts just finished reviewing the online voter registration process in the 20 states that offer it. The report notes cost savings, mobile optimization, and accessibility for those with disabilities or English as their second language. Most importantly, electronic voter registration offers a real advantage for maintaining accurate and up-to-date registered voter rolls, reducing the potential for voter fraud. In addition, and not discussed in the report, accurate voter rolls play an important part in voter turn-out statistics. With the wide spread reports and studies showing millions of people registered to vote in more than one state and millions more registered voters who are actually deceased. It is possible that the US’s record low voter turn-out in recent years is not as low as it appears. Electronic and online voter registration could offer real solutions in the debate over voter fraud. In 2002, Arizona began paving the way for online voter registration. Many other states quickly followed suit. As of April 2014 it was available in 20 states and, according to the Brennan Center, seven more states have either passed legislation for or are currently working on implementation of online registration. States are spending between $0.50 and $2.34 less per online voter registration compared to paper registration. Some states offering online voting have not yet been able to realize this savings because the local counties are not yet fully integrated electronically and the online registration is still having to be printed and sent to these counties. California reported saving $2 million in 2012 as a result of online registration. Implementing the online process cost less than $300,000 in nine of the fourteen states that reported cost with an averaged of $249,000 per state overall. Online voter registration improves accuracy of the state’s voter rolls by identifying duplicate registrations. This typically occurs when a person moves and registers to vote in their new county without notifying the old county of their move, but it is perceived as voter fraud by many and definitely has that potential. Has the potential of offering that same benefit between states once all states have implemented an electronic database of registered voters. 6.9 million voters are registered in more than one state. Accurate voting rolls also means more accurate understanding of voter turn-out. 16 of the 20 states offer real-time connection with DMV for processing registrations. Has the potential of improving the process of removing deceased individuals from the voter rolls as well, especially if states also have a centralized electronic system for death records. Again, deceased individuals who are still registered to vote is mostly perceived as voter fraud, but definitely leaves the door open for it and it absolutely does affect the accuracy of voter turn-out statistics. According to 1 study, 1.8 million dead persons are still in the voter rolls in the US. 9 of the 20 states with online voter registration have mobile accessibility. Easier registration for military members stationed away from home and those in rural communities. Half of the states offer languages other than English. Improves access for persons with disabilities that might affect their ability to register using traditional methods. All states cited customer satisfaction and reduced burden on election officials as the main benefits of online voter registration. All states except Delaware require state driver’s license or ID number for online registration, though Maryland does offer alternative for those citizens covered by the Uniformed and Overseas Citizens Absentee Voting Act. This is despite the fact that some of these states requiring state driver’s license or ID number for online registration only require non-photo identification for voting. Get more information about the challenges for voters when requiring state ID’s on our Voter ID page. Not every state has been able to fully integrate electronic registrations with local officials, so they are missing out on the cost savings and/or efficiency available with online voter registration. Some states noted their own short comings with promotion of electronic voter registration citing only a small percentage of their registrations are occurring online. Which States Offer Online Voter Registration? NOTE: It appears that Missouri’s site will prompt desktop users to fill out a printable pdf form and mail their registration application. Where as, mobile, tablet, and touchscreen users are offered online submission. NOTE: It appears New York only offers online registration through the state DMV since the state government’s site only offers pdf forms to fill out and mail. the state’s site doesn’t even list online registration as an option. 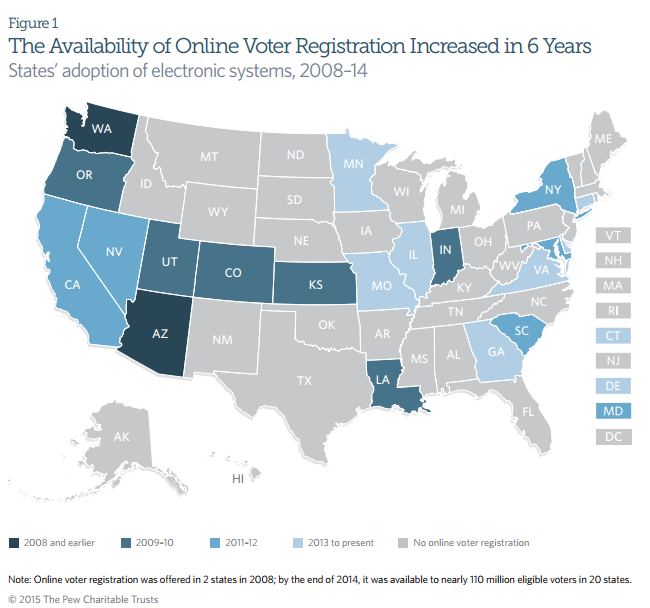 What States are Expected to have Online Voter Registration Soon? Hawaii – Online Registration is expected in 2016 and will offer election day registration at all polling sites by 2018. Iowa – Currently you can submit electronic voter registration in-person at the state’s DMV and expected to have online submission in 2016. Massachusetts – Currently you can submit electronic voter registration in-person at the state’s DMV and they have passed an online voter registration ballot measure, but it is not yet in effect. Oklahoma – In the process of implementing, but no ETA available. Nebraska – Currently you can submit electronic voter registration in-person at the state’s DMV and they have passed online registration legislation expected to go into effect in 2017. New Mexico – Currently you can submit electronic voter registration in-person at the state’s DMV and is in the process of implementing online registration with no ETA. West Virginia – Have passed legislation for online voter registration, but no ETA as of yet.